Born on June 19, 1623, in Clermont-Ferrand in the Auvergne region of France, Blaise Pascal was a prominent French writer, Christian philosopher, physicist and mathematician. He is regarded as one of the greatest writers of the Classical Period in French literature and his literary work was a major influence for famous French writers and philosophers such as Jean-Jacques Rousseau and Voltaire. Five years after the death of his mother, Blaise Pascal moved to Paris with his two sisters and his father, Etienne Pascal, a lawyer, tax official, and wealthy member of the Nobles of the Robe (French aristocrats whose nobility was based on their administrative/judicial positions that could be bought or sold). A child prodigy with exceptional abilities in terms of mathematics and physical sciences, he was educated at home by his father. At the age of 16, Pascal wrote his first important treatise of mathematics, entitled Essay on Conics, which took the French mathematician and philosopher Descartes by surprise. At the age of 19, he invented Pascal’s calculator (later called the Pascaline) which was able to add and subtract, in order to help his father with his endless tax calculations. In 1654, 31-year-old Pascal lost interest in scientific work and decided to focus solely on theology and philosophy. After undergoing his religious conversion, he started writing his first significant religious work entitled The Provincial Letters (1656), which emphasized the fact that charity makes possible the union of the soul with the mystical body of Jesus. This widely praised body of work comprising 18 letters which were written in defense of theologian Antoine Arnauld denounced case-based reasoning, the popular ethical method used by the Jesuits in the late 17th century. They were motivated to use reasoning to justify a multitude of sins before God. Pascal’s philosophical beliefs were governed by the theological perspective of the human condition, according to the Jansenist doctrine, which also determined his negative evaluation of the value of scientific research. Pascal’s most important theological work, posthumously named Thoughts incorporated the philosophical concept known as Pascal’s Wager, a groundbreaking argument in apologetics which postulates that people bet their own lives on the existence or non-existence of God. According to Pascal, a rational individual should live as if God does exist and strive to believe in God for an infinite gain. If God does not exist, then the individual will experience solely a finite, material loss (a lack of luxury). Using contradictory philosophies of stoicism (Epictetus) and skepticism (Montaigne), Pascal aimed at making the non-believer embrace God by bringing him on the verge of total despair. The wager was formulated within a Christian framework and it was the forerunner of later philosophies, including pragmatism and existentialism. 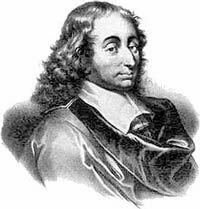 Blaise Pascal died at the age of 39 on August 19, 1662, in Paris, France. The cause of death was uncertain, but many scholars believe it was either tuberculosis or stomach cancer. He is buried in the cemetery of the Parisian church Saint-Etienne-du-Mont.